MassRoots’ Chief Executive Officer Isaac Dietrich called in to SmallCapVoice.com to go over the business model and markets served by his company. 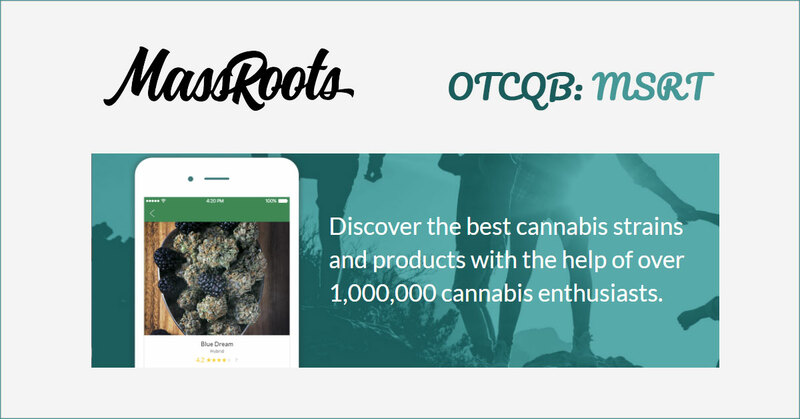 MassRoots, Inc. (OTCQB: MSRT) is a leading technology platform for the regulated cannabis industry. Powered by more than one million registered users, the Company’s mobile apps empower consumers to make educated cannabis purchasing decisions through community-driven reviews. Its rewards program, WeedPassTM, enables consumers to earn tickets to movies, sporting events, and festivals by shopping at participating dispensaries. MassRoots has been covered by CNN, CNBC, Fox Business, Fortune, Forbes, and Reuters. For more information, please visit www.massroots.com/Investors and review MassRoots’ filings with the U.S. Securities and Exchange Commission. This interview may include forward looking statements. These forward-looking statements generally are identified by the words “believe,” “project,” “estimate,” “become,” “plan,” “will,” and similar expressions. These forward-looking statements involve known and unknown risks as well as uncertainties, including those discussed in the following cautionary statements and elsewhere in this release. Although the Company believes that its expectations are based on reasonable assumptions, the actual results that the Company may achieve may differ materially from any forward-looking statements, which reflect the opinions of the management of the Company only as of the date hereof. SmallCapVoice.com, Inc. received $6,000 from the company on 3-22-19 for 30 days of service.